Once again this year, we haven't had much snow. But we did get some on Friday so we thought we best take advantage of the last possible weekend we had to partake in a winter activity. We were going to take the kids skiing but that seemed like a lot of work for a few hours of actual skiing and Austen had baseball tryouts right smack in the middle of the afternoon so we had to cancel those plans. 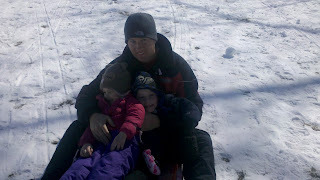 Instead we decided to go sledding. The kids were beyond excited since they have been talking about it for weeks. 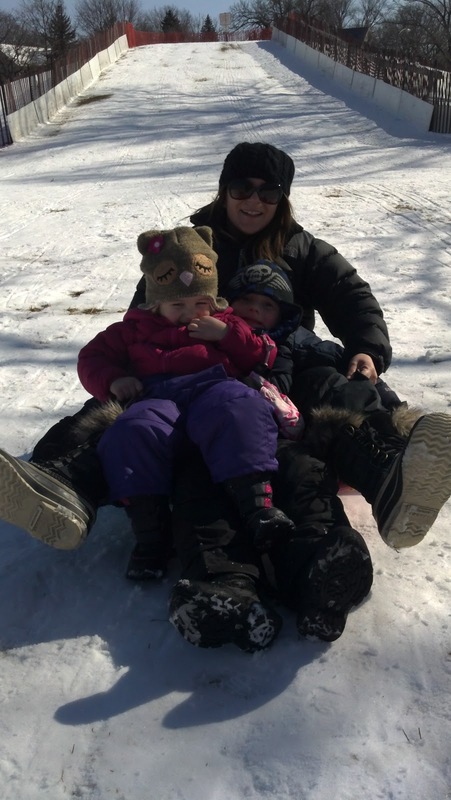 We trekked out to the suburbs to our new soon to be suburban town (more on that in a future post) to try out a little sledding hill close to our new house. It was the perfect size for our kids. They were able to go up and down by themselves easily and they got a lot of runs in as it wasn't crowded. 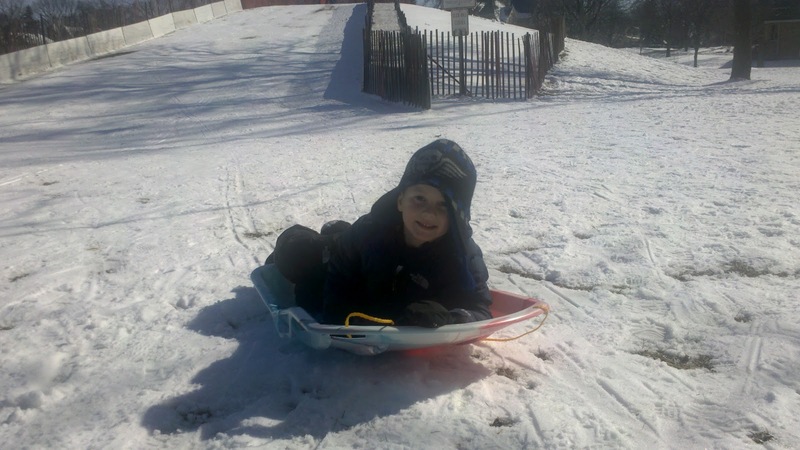 Tom even saw one of his old roommates on the sledding hill who lives nearby. Small world. The only drawback was that I had to blow up this inner tube sled and it took me almost the whole time we were there to blow it up so the kids had to share. 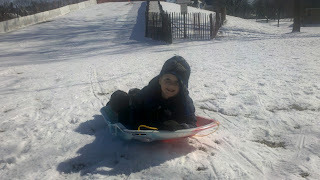 It didn't matter for the first 20 minutes anyway as Peyton claimed she was scared and didn't want to go down the hill. After awhile, she wanted to try and you could hear her laughing the whole way down the hill. And, when she got to the bottom, she was saying, "I want to do it again!" We had a great morning, enjoying the sledding and time with our kids in our new town while the sun shined and Adler also got to enjoy the snow. Peyton has been very into dressing up ever since she could figure out how to put on clothes and shoes. She often goes into Austen's room and puts on any dress up clothes he has as well as a mismatch of shoes from his closet and any zip up sweatshirts she can find. She likes to put them on all at once as is evidenced by this picture! So for Xmas, she received various princess dresses for dress up. She loves coming home after school and heading for her bedroom so she can try them all on. In fact, lately she has been telling us after she puts on her dress up clothes that "I'm not Peyton! I'm a princess!" Or sometimes she'll say "I'm Cinderella!" The other day I asked her what she wanted to be when she grew up and she responded, "Cinderella!" There is no shortage of love for the princesses in our house that's for sure although she does enjoy wearing her brother's shoes, sweatshirts and anything else she can find to put on. In fact, if you leave her in her room unattended, she's likely to come out with an entirely new outfit after rifling through her drawers! I'm in trouble. I made it to age 6 with Austen and he still wears whatever I put out for him. Peyton has been picking out her pajamas since she turned 3 because she insists on choosing her own clothes and this is a good compromise since there is no way I'm letting her pick out her own clothes. I guess I'm okay with it since no one can see what she's wearing when she's sleeping! Thanks for all of the concern about Adler. I know that last week's post was not what a lot of people were expecting to read but one that was a clear depiction of what our life had been like that week. This week was week two for Adler and she is still not back to normal. She hasn't thrown up for almost a week now but she has continued to have major intestinal issues that has caused whatever she eats to run right through her. So she's eaten a lot of rice and chicken this past week mixed in with Pepto Bismal and Immodium AD. The meds seem to help but as soon as she is off them and I try to mix in regular food to her diet again, she's right back to where she was before...sick as a dog - no pun intended. Both the neurologist and her vet said to ride it out, it's likely some viral infection that has to run its course but seriously about 10 days in counting now is a long time! Anyway, I'm hoping that this week Adler is on the road to recovery. Tom's back so at least that will make it a lot easier. On Tuesday, I came home per usual, unlocked the front door and prepared to take Adler out quickly to the side of our building so she could pee. She was unleashed as she is well-trained to do her business and quickly come back inside. All seemed normal as she greeted me at the door, I put down my bags and off we went. But no sooner did she get to the side of the building then she started acting strangely, running tight circles around a tree and then collapsing to the ground on her side. I ran to her and noticed that she appeared to be trying to get up but couldn't. She was immobilized and twitching and foaming at the mouth. I knew enough that she was having some sort of seizure and aside from praying it would end quickly, I gave her space. It probably lasted only 30 seconds but what happened after was way more traumatic for both her and I than the actual seizure. After a seizure, dogs go into this almost catatonic state where they say they act almost blind. As soon as she was done seizing, she got up off the ground and ran from me. Again, she was unleashed and we live at a very busy intersection with four lanes going in each direction. Luckily, she ran toward the back of our building where there was a fence and I was able to coral her. She was so terrified, my 73-pound dog tried to scale the fence to get away from me. She was barking incessantly at me and baring her teeth so there was no chance I could have grabbed her collar without getting bit pretty badly. I gave her a little space. She ran again and I ran after her into another little fenced enclosure...Thank God. At the vet, they ran blood tests and referred me to a neurologist. First sign she wasn't okay was that she wasn't trying to escape from the vet's office. Definitely not herself. Wednesday morning, I took her to the neurologist. Who knew dogs had all the same specialty doctors that people do?! He took full x-rays of her and scheduled her for an MRI on Thursday. Thursday morning, I took her in so she could undergo the MRI where she would need to go under anesthesia. I picked her up Thursday afternoon. She seemed great. A little sore from all the trauma caused by the seizure but she was anxious to get out of there so she seemed more like herself. Friday she seemed alert and was even begging for food while we ate dinner although she was still sleeping a lot. Friday she threw up in the middle of the night and continued to throw up again on Saturday morning. She didn't touch her food on Saturday until well after 5 p.m. and she even refused treats! She continues to sleep a lot and I'm hoping her body is just recovering from the trauma of the seizure and the anesthesia. The diagnosis was idiopathic epilepsy which could be genetic but the neurologist said there was no need to put her on medicines for it right now until they occur more frequently (we think she also had another seizure about two to three years ago when Tom was at home). All the tests including the blood, x-rays and MRI all showed that she was a very healthy dog. I was worried about those tests. Not only what it would show related to the seizure but what else would turn up. Bernese Mountain Dogs are very prone to health issues. The fact that nothing came up was a great reassurance that despite being age 8 and in the middle of the life expectancy of 7-9 years for the breed, I still had some good years left with her. I'm glad for that. I will make every one of those years count. One out of three places where they had to shave her for the MRI (her leg looks so skinny!). A little video of the patient on Friday.